Alfred and Hannah were awarded undergraduate research fellowships to continue their research in the lab this summer. Alfred was awarded the Provost Undergraduate Research Fellowship; Hannah was awarded a Summer MRSEC Undergraduate Research Fellowship. Congrats to both! The group celebrates the holidays with a game night. 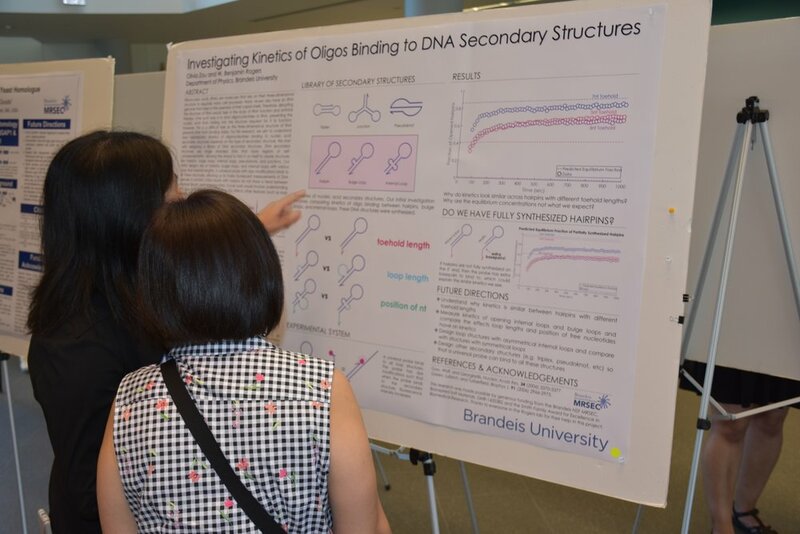 Larry, Olivia, Alfred, Nate, and Guoxi all presented their summer research at the 2018 Brandeis SciFest. Topics ranged from kinetics of biomolecular interactions, surface chemistry, molecular dynamics simulations, to lipid bilayer membranes. Great work all around! We are excited to have four new undergraduate students joining us for the summer: Larry Luster, Nathan Weber, Alfred Yeung, and Guoxi Zhu. Larry is an REU student from Hampton University in Virginia; Nathan is a student in the Quantitative Biology Research Community at Brandeis; Alfred is working on a collaborative project between the Rogers Lab and Ivanovic Lab, which is supported by a Provost's Research Award; and Guoxi is a Summer MRSEC Undergraduate Research Fellow. Welcome! Ben receives the Smith Family Award for Excellence in Biomedical Research! 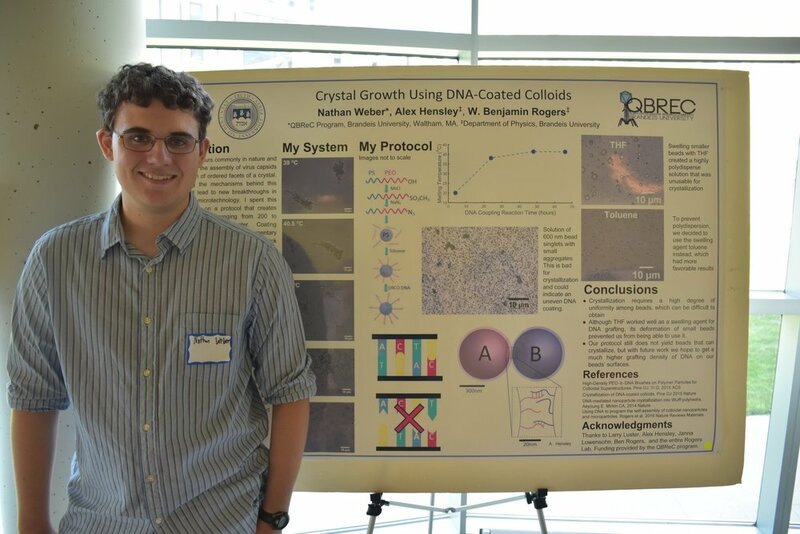 Ben was selected to receive the Smith Family Award for Excellence in Biomedical Research. The award comes with three years of financial support to initiate a new research direction in RNA structure and interactions. 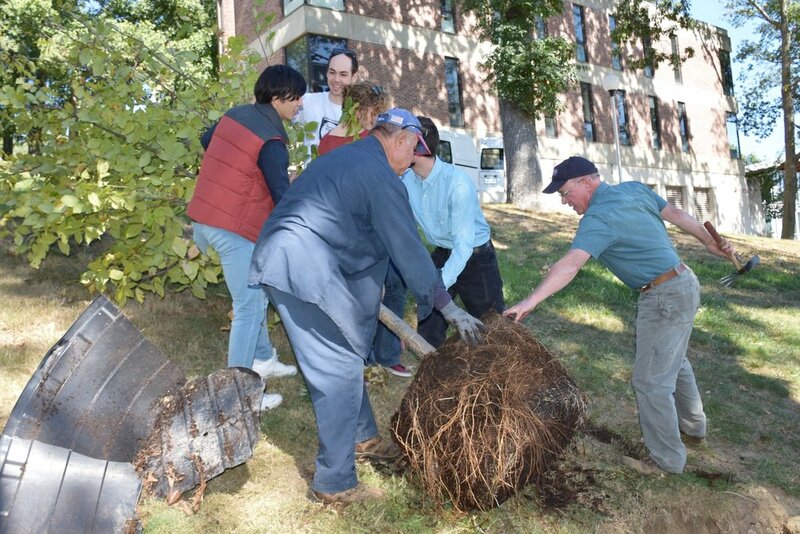 To atone for all the gloves and pipette tips we throw away, the lab planted an American Elm tree on campus. Important update: The tree has been named Jahbs. We received our first grant from the National Science Foundation! We are grateful to the National Science Foundation's Division of Materials Research (DMR-1710112) for their support of our work on colloidal phase transitions. Thank you, NSF! Daichi Hayakawa joins the lab from Tokyo as a first-year PhD student in Physics. Welcome, Daichi!